It's big, it's bronze, and it's beautiful. The Texas town of El Paso, a bustling city with a colorful history, is home to the world's largest equestrian bronze figure. The massive statue, which stands nearly 12m tall, is made up of 400 pieces. It consumed nearly 10 tonnes of bronze and requires more than 4.5 tonnes of supporting steel. 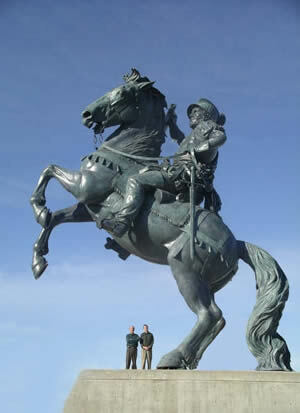 The sculpture is the work of artist John Houser, called The Equestrian, it portrays Mexican conquistador Don Juan de Onate riding a rearing Andalusian stallion. It has been installed at El Paso's international airport, and was formally dedicated at a ceremony on April 21, 2007.